Enjoy the magic of Puerto Vallarta while staying in the best location, the Shangri-La. Our 4000 Sq Ft, 2 story penthouse is located on 15th and 16th floor of tower 3 in the center. • Panoramic views of the ocean, the Marina, and downtown Vallarta from every bedroom in the main unit as well as the living, dining and the kitchen! • Full time (9AM - 5PM) Maid included. She cleans the whole place and can prepare snacks and light meals. You just relax! • Every bedroom in the main unit is a suite with marble baths and large walk-in closets. • State of the art home theater system allows you to have your music in the balcony while the kids watch TV or listen to their music inside. • The elevator which serves both floors opens in the living room and the views will take your breath away! 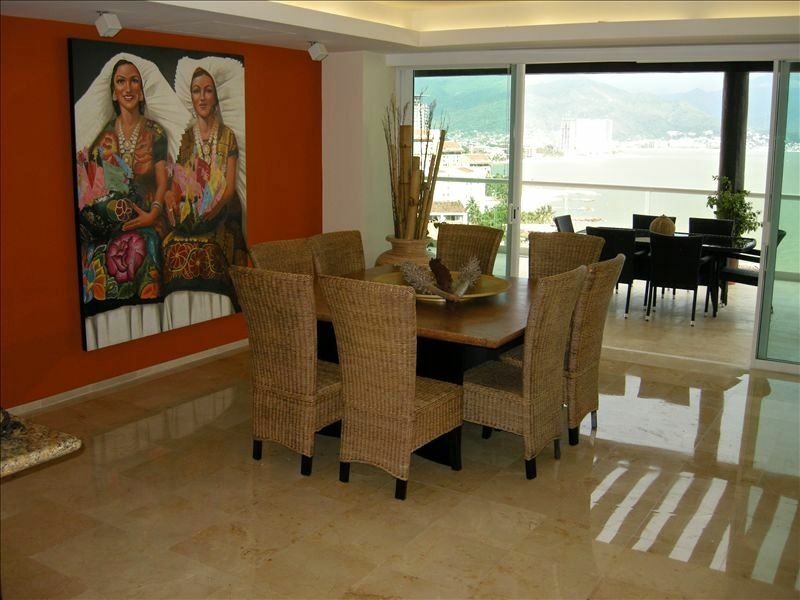 This penthouse is professionally decorated in modern style accented with traditional Mexican decor to create a unique Vallarta style. The walls are adorned with exquisite paintings from famous local artists to enhance your experience. 2 line phone. Line 1 is Free US calls. Line 2 is for Mexico local calls. Separate air conditioning with control for each room. Free secured WiFi. Please ask for the code. Upgraded Viking stove top. Stainless steel appliances. Opens to the main balcony with panoramic views of the bay and downtown Vallarta. Flat screen with blue ray player in a high-end home theater setting. Cable TV included. Apple TV allows you to play your music or favorite videos. Largest Balcony of any condo in Vallarta. It is 2 story high with a pergola. 1 acre resort style infinity pool with swim-to bar and pool-side restaurant. Amazing Condo in a fantastic location! Roak P.Where do you live? You cannot get any better than this condo in this location. Waterfront. Unbelievable views! Great comfortable condo with great bed/bath rooms all with great views. Hours spent lounging on the deck looking at whales, boats, and town. Fantastic facilities and amenities. Uncrowded beach and pool. 5 minutes from airport. Walk across the street to the marina or taxi into town. Poolside cafe for food and drinks. This is the spot! Beautiful condo with an excellent view. Convenient location is very close to everything marina-oriented. Pools and beach are beautiful and close. This property was just as described and was, for the most part, accessible to someone in a wheelchair (beds were too high). We didn't use the maid service much, but when she was there, she was very accommodating and unobtrusive. Will definitely stay again. When we first looked at condos to rent 7 years ago, we instantly fell in love with Shangri La. Incredible luxury, wonderful views and beautifully maintained grounds. It’s right across from the marina and 20 minutes from Puerto Vallarta center, a great location. The best part is Atousa’s penthouse. We’ve rented it for 4 years now, and each time it’s like coming home. The condo is beautifully decorated and maintained. It has everything you need to feel at home. Every convenience is there! We are always welcomed by Atousa’s team Marcos and Aurora. Marcos is very attentive to any need and Aurora is a great housekeeper! Any problem is taken care of immediately. We love listening to the waves at night- it’s very relaxing. My favorite place is the balcony with its magnificent views of the grounds, pool, beach, and the bay. It can take your breath away. There’s always one more look from the balcony before we tear ourselves away. We love it! It’s magical! For the past five years, nine siblings have been thoroughly enjoying this two floor magnificent Penthouse Condo. From the moment your private elevator door opens, you are transported to a new world, which includes a stunning panoramic ocean view. This spacious condo is tastefully decorated. Aurora & Marco are there to greet you with Margaitas, chips, and homemade guacamole. This is a secure, gated community, less than five minutes from Airport. On-site restaurant with poolside and room service. The Ocean is a mere 50 feet from private pool. You can walk two blocks to the Marina restaurants/shops, or catch the bus for a twenty minute ride to downtown Puerto Vallarta, where you will find local artists on the Malecon, restaurants and shopping. This condo has a well stocked kitchen for in home cooking; or you may have Aurora work her magic by cooking for you. She loves exchanging Spanish/English lessons. Aurora also cleans as often as you prefer. Washer/dryer in condo. Once you stay here, the question is not, will I come back? It is, how can I extend the stay next year!! Our Family spent eight wonderful days at Atousa's penthouse and enjoyed every minute of our time there. We were greeted by Marcus upon our arrival on Thursday October 23, 2014. This was our second stay for my wife and I but the first for our children and grandchildren so we were reasonably familiar with the unit and the Shrangi-La complex. Everyone was so pleasant and helpful; they went out of their way to ensure that we were well taken care of. From the security people at the front gate to the security people in our building they recognized us and greeted us each time we arrived. The gentlemen at the pool - Pedro and Daniel - were so nice to our entire family but especially to our grandchildren, we cannot thank them enough!! The lady that maintained the unit, Aurora was excellent! She brought my wife flowers and prepared a very special seafood salad when our children arrived a few days after we did. Everything about this penthouse is beyond expectation! We will return as often as we can! To all the staff at the Shrangi-La we want to say "Mucho Gracias"!!!! !